How to Remove Old Carpet | Is It Time to Tear Out Your Carpet? There’s no stopping carpet from getting old. By scheduling carpet cleaning from Chem-Dry of Fort Wayne each year and vacuuming on a routine basis, you can extend the lifetime of your carpet but it is inevitable that it will wear down over time. After awhile, you will notice carpet bubbles and other signs of irreversible wear and the carpet will need to be removed and replaced. To remove old carpet from your floor is a simple DIY job you can accomplish over a weekend. The first thing you need to do is go to one of the corners of the room and pull the carpet up from the corner. You might need to use a tool for leverage or a razor blade to create a seam in the corner you can lift up. Now pull up a large section of the carpet. You should then use your razor blade to cut the carpet into sections. Then after you cut off a section you can roll it so that it will be easier to transport to the front of your home for disposal or to your vehicle to transport it to a recycling center or garbage dropoff near your home. Continue this process until you have pulled up all of the carpet from the floor. You now need to remove the carpet pad that is beneath the carpet. The pad is stapled into the subfloor so it will be harder to remove than the surface carpet. Now that the carpet pad and the carpet are removed, you will need to remove all of the staples from the hardwood floor or the subfloor beneath the carpet. Do not install new carpet over the staples. Take the time to remove them. You can use the back of a hammer or you can purchase a tool specifically for removing floor staples. The job will be much easier with the proper tools. To remove the carpet and the pad should only require a couple of hours but to remove the staples from the floor can be a long process if you don’t purchase the tools necessary for the job. You can now purchase new carpet for your home or refinish the hardwood floor beneath and decorate with area rugs for a new look in your home. 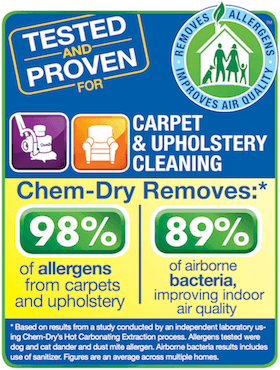 To schedule carpet cleaning for your old or new carpet, call Chem-Dry of Fort Wayne at (260) 409-1138 today!